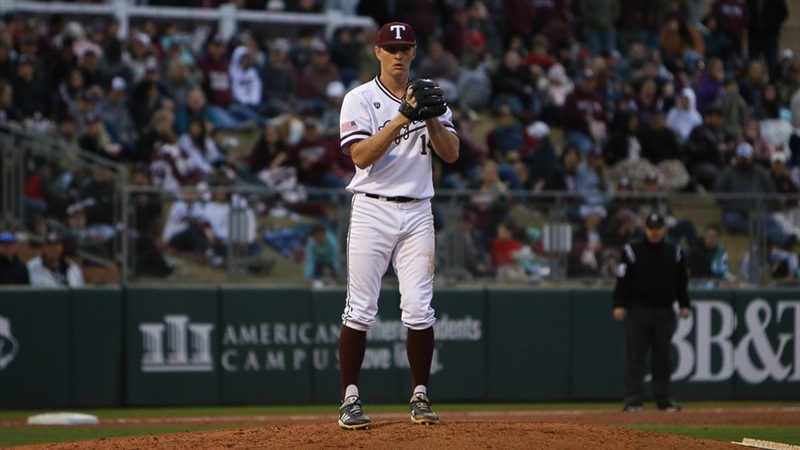 “If you’re a fan of college baseball, John Doxakis and Tanner Burns going at it is a thing of beauty,” Rob Childress remarked after the pitching duel between Doxakis and Burns ended with a 4-0 Aggie win. The two teams found little offensive success off the two starters, but it was Texas A&M who broke through and found a way to win with timely hitting and a strong pitching performance from their ace. The first trip through the lineup for the Aggies saw little action. The Ags went nine up, nine down to open up the game against Burns. In the top of the fourth, Chandler Morris would give the Aggies their first hit of the game – a single to left. After Burns walked Braden Shewmake on four consecutive pitches, Mikey Hoehner worked a long at-bat into a 2 RBI double off the left field wall to give A&M a 2-0 lead after the fourth inning. Mikey Hoehner’s two-run double in the fourth gave the Aggies an early lead. Texas A&M would manufacture another run in the fifth. A leadoff single by Will Frizzell followed by a slow ground ball to the pitcher off the bat of Ducoff set up a runner on second with just one out. Burns, who struggled keeping the ball out of the dirt in several at-bats throughout the night, threw a pitch past the catcher to advance Frizzell to third. Zach DeLoach would execute with a line driv to center to score Frizzell on a sacrifice fly and give the Aggies a 3-0 lead through five innings. The Aggies would grab one more insurance run in the bottom of the eighth. Bryce Blaum led off with a double, and a single from Chandler Morris would give the Aggies a 4-0 lead heading into the ninth. Through 8 innings, Doxakis had thrown 97 pitches and Childress elected to give him a chance to complete the shutout. However, after a five pitch walk to start the ninth, Childress elected to make the call to Bryce Miller. The righty struck out 3 Auburn hitters to close out the game. John Doxakis threw 8+ shutout innings, struck out 6, walked only 2 and improved to 4-2 on the year. The A&M win ends their two-game losing streak, and weather permitting, they’ll be back in action tomorrow afternoon for game two of their series against Auburn. First pitch is currently scheduled for 4:00 p.m.